At some point, the terms “armatol”, “cleft”, “palicar”, “comitagiu” were synonymous and referred to rebellious, warrior men. You would need to write an epic song if you wanted to recount how they got to the mountains. Pouqueville claims that they gathered according to some very old military structures that were called căpitănate (a sort of captainhood). The Turks, who were all too interested in maintaining order in the region, did not suppress them. 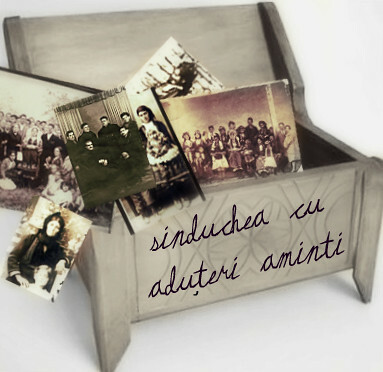 A căpitănat was inherited. Caragiani specifies that it could also be dowered. At some point, there were some 180 căpitănate. The sultan approved them and the Turks adressed their captains using the terms bei and paşă. When the Turks started to replace the Aroumanian captains with Greeks and Albanians, some of our people, who were offended to death, retreated in the mountains. The celnics offered them support by giving them money and food. They gave them little, so they wouldn’t take more by themselves. The calendar of the cleftsand the calendar of the Aroumanian sheep breeders counted two seasons: the warm season, that started with St. Gheorghe and ended with St. Dumitru, and the cold season, that started with the latter and ended with the former. Winter would be spent in the plains and summer in the mountains.I owe to Fauriel an accurate description of these controversial characters. The captains and the clefts get mixed up in his writings. Fauriel claims that one could change his captain status into a cleft status and the other way around, because, he specifies, the ones who were fighting the resistance would remain to gravitate around the unit that they belonged to. Willing to defend the territory from more harmful thieves, the Turks tried to win them on their side by offering them the watch of the dervene (passes). The position was well paid. This is what set the difference between the wild armatols and the tamed ones. You could distinguish the wild ones by the red wollen girdle that they used in order to immobilize their prisoners. Other than that, Fauriel describes both as carrying a rifle, a sword, a knife, an armour that covered the chest and silver lids that were attached to the knees with leather straps. The Frenchman pitied their complete lack of military tactics and claimed that the most famous warriors fired their pistols and rifles from a random position – standing, sat on their knees or lying on the ground; that they childishly hid behind trees and heaps of dead bodies, that they put a high stake on the surprise attack by coming out of the blockade in a hand-to-hand fight. He also wrote down with admiration that Nico Ceara was able to leap over as many as seven horses, that some of them were capable of jumping over three carrianges loaded with thorns, and that others could outrun the horses. He also writes down that they could all easily bear hunger, thirst, pain and lack of sleep, that they preferred to die rather than be caught, and that they knew no greater shame than having their captain captured. For those who don’t know, Fauriel’s book is an anthology of songs. The Albanians called these songs bucovale, Bucovală being an Aroumanian armatol who, after many battles in the Balkans, entered the russian military service and died, in unknown circumstances, in Jerusalem. 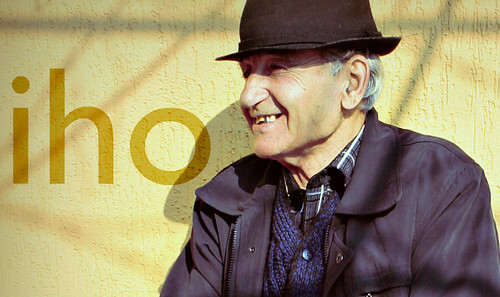 I inherited this next story from captain Spiru, my Greek grandfather from my mother’s side. It goes like this. The Aroumanian armatols that distinguished themselves in battle in Misolonghi gathered to decide which one of them would go to England; Lord Byron had praised them, he thought they were Greek and so, the King, or the Queen, whoever was on throne at the time, had invited them to London. One of them proposed they should do this, the other said they should do that, until their leader, bored to death, said: Enough with that silly talk of yours, is England what you really need?You better take a look at yourselves… And he critically pointed his eyes at their uncut nails, their sunken cheeks, their expensive and dirty clothes, their muddy shoes. Just take a look at yourselves, he repeated, and stay where you are. It’s better if we are just spoken of, we have nothing to show. This is one of the reasons why I think that unworthy acts like the one committed by Caramiciu cannot cast a shadow on the image of these palicari with moustaches, dressed in clothes that glittered of silver and gold, immortalized in portraits that today hang in the Museum of History in Athens. They were surely thieves, but they wrote history with capital letters, carrying with them, everywhere they went, a torn piece of land from which the new Hellás was built. But it wasn’t for the Hellenic Kingdom that my Aroumanians fought. Later on, in coffee-shops, when they will have grown old and disappointed, they would explain the matters like this: All we wanted to do was to establish the rumeic – a multinational state, built after the model of the Byzantine Empire. That’s what we aimed for, but instead, all we did was to take our people on the road to perdition! If you look for them, you’ll find them everywhere! I bumped into Aroumanian armatols in places and times I never expected to. Consequently, I had to give up the patriarchal image of the warrior smelling like sheep. Often, wings of vultures would carry them far away. Here’s an example: the chamberlain of the Empress Catherine II of Russia was an Aroumanian from Seatiştea, called George Papazoglu. You can imagine what the importance of his role was when you think that he convinced the Empress to send admiral Orlov in Greece with the precise order of raising the population against the Turks. It all happened in 1765, 56 years before the Eterie. 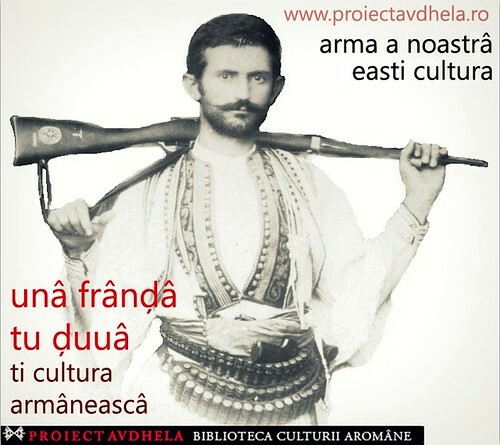 So, if Papazoglu anticipated the Eterie half a century before it actually happened, and Rigas – the Aroumanian from Velestin – formulated its manifesto, and ultimately, if the guns and the arms of the Aroumanian armatols fought for the freedom of Hellás and actually won, can you imagine the slice of history that should have righteously belonged to us? Well, know that we got nothing. Not even the crumbs! William Martin Leacke, being himself the guest of a vizier, had the opportunity, how I wish I was there, to witness the arrival of a group of Aroumanian celnics who had travelled to the Sultan’s court to pay their imposts, to be more precise, their poll taxes for the sheep (just like in the time of Solomon), the right to work on timber, to fish and so on. A trifle, actually, for Sultana Validé’s chest – the woman in the harem that had the honor of being the sultan’s mother. The money had to arrive in time; the celnics had descended from the mountain especially for this. Now, here’s what I think the Englishman saw, because that’s what this is all about. At the vizier’s court, in the scented chambers that were draped with carpets, the visitors came and went on tiptoes, bowing, kissing somebody’s coat tail or rings, throwing a glance or whispering a word. The Aroumanians have arrived, announced the one whose job was to let newcomers in. Thinking of those brutal men with fierce looks, reeking of horse and sheep, the vizier said: Don’t let all of them in, let only the chief in, it’s enough! Only the chief comes in! the Turk passed the message, but after a few moments, he came back and said: I told them what you told me but they answered – writes down the Englishman – “We are all equal”. Strange people we were, I tell you! The chief would take decisions for everybody, the old one would lead the young one but, all of a sudden, we are all equal, how come? In addition to that, there’s also the fact that, in the Aroumanian dialect, there are no pronouns for politeness. Also, around the year 1920, a certain Aroumanian shepherd took the liberty of speaking very freely to teacher Gheorghe Celea, who was considered something of a king in and around Gramaticova. The intelligence, training and devotion to the community made Celea a “king”, whereas the old age of the shepherd conferred an emperor’s status on him. The comitagis appear later on in history, playing the role of fallen angels. Nevertheless, their career sometimes imposed respect. As a proof of that there’s the story of the bandit Caiu, who was pardoned by one Sultan after having ravaged mount Tomor for twenty years, as a reward for the merit of having never been caught. In the year 1879, Vasile Jurcu, the chief of a gang, together with 25 farsherots tortured six people and stole 100 liras from them. The next day, near the village of Comati, two bandits went out and demanded 50 coins for each cattle. The shepherds got angry with them and killed them. Here’s another fact. 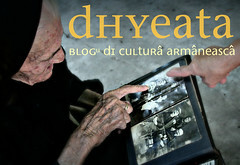 On the 4th of February 1905, some two hundred men set Hagigogu’s fields on fire, which were situated around Caterina. The officer that led the two hundred bandits bore a flower’s name, Amalia. But there was a certain code of honor that the bandits respected. They only killed people when there was no other option. They usually shot at the horses’ feet. Thrown down from his horse, one ceased to be dangerous. Another example that illustrates how people used to die in the Balkans is written down by Burileanu. The man that is about to die in his story is Aroumanian and he was attacked by four Muslim Albanians. He knocked one of them down, but then he himself fell, wounded by someone else’s bullet. When the bandits approached him, thinking him dead, our man took advantage of the situation and unloaded his pistol in one of the three thieves’ chest. The others were infuriated and unloaded two bullets in him, one each. Then, they approached again but he still wasn’t dead. So he grabbed his gun with both hands and hit one of the others in the head, killing him. Of course, the surviving bandit shot him dead and was, of course, also the one who was left to tell the story. Fauriel and others claim that pistols in the Balkans rarely hit the target. They also write down that one test they did in the shooting exercises was to try and hit a coin while it was being thrown up in the air. The only conclusion to be drawn from all this is that there were good shooters and bad ones. Mitru Vlahu was one of the good shooters, for example, whose picture I saw in Burileanu’s book. Short, with long hair and black beard, a kind of Robinson with hamaili – small silver crosses chained and hanging on the chest -, he shot pretty darn well. One day, he found himself surrounded in a house in Kastoria after having shot a Turk that had approached him right in the head. Seeing another Turk blowing his trumpet in order to call another attack, he eyed him so well that the bullet hit the Turk right in the mouth after passing through the trumpet. No more, no less! They say that in Sipisca there was a gang of bandits that occupied an entire suburb. On St. George day, they would gather, as if the Olympic Games were about to start, and they would fry a ram alive. Alice, our Goddaughter, belongs to the Coconeş family. She has no idea what a fierce ancestor she left behind. He was a grecoman, which means an opponent of the movement that aimed to approach the Aroumanians to the Roumanian people – a knave with a moustache as black as coal. His protection was worth as much as that of the Sultan. I write out the dialogue from Burileanu’s book: Do you see this rifle? Nobody here is allowed to wear it; it’s a soldier’s rifle. I took it, only I know how, and if I want to, I can walk freely through Pogradeţ without having to answer for it in front of anybody. And this goes for all the people in the Coconeş family. We do not pay taxes to the Turks. Nobody would dare to impose a tax on us. If somebody killed me, my bother would put a bullet in that man, and if my brother were also murdered, another brother would come. We are many, and we all came into this world wearing a rifle. The writing style of the book is a simple one, which leads me to believe that the author wrote down the exact words of the knave. He listened to him, and then he explained what a terrible thing it was to be a grecoman, because, look, you belong to the Romanian people whom you should defend. Coconeş said, thinking – again, I quote: See how you filled my mind with nonsense? What can I tell you? How should I know? What should I believe? Well, if you are our brothers and Romania is our motherland, where have you been all this time? Why did you leave us at the mercy of the Turks and of the Greeks? Us, Aroumanians, we are brave, but we are orphans; we have no father. If we find out our father is alive, you just wait and see! When they parted, Coconeş kissed him on the mouth as if he were his brother but “miss” Burileanu, because that’s what he was, washed his lips at the first spring of water he could find and then wiped them with a handkerchief, to erase the traces that a knave’s mouth left on his own. 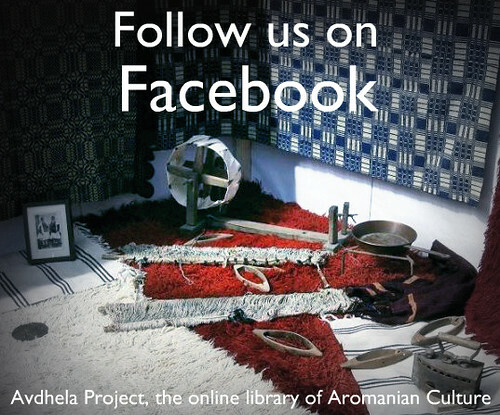 This entry was posted in arman, Aromanian, aromanian books, Aromanian Culture, Aromanian literature, Aromâni, Avdhela, Avdhela Project, biblioteca virtuala, Culture, Dhyeata, haide bre, irina nicolau, literatura, literatura armaneasca, manakia. Bookmark the permalink. So great to see this; I met Irina Nicolau once or twice and thought she was brilliant. But I didn’t know about her interests and connections with the Aromani. Now I’m working on a shepherding book, so it’s even better.